Something I have always found fascinating is the tourists come here and are shuttled in busses and the back of trucks 4 to 6 high speed hours into remote areas to go on treks. 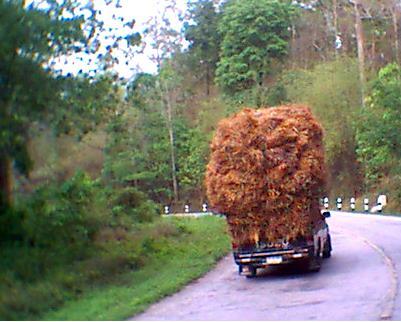 The area between the Samoeng, more or less due north to the MHS road, Mae Taeng, and Mae Rim has, at a rough estimate, 100 unmarked villages and is a spiderweb of local roads. In just that little area a half hour from Chiang Mai one could trek, tour and wander for a solid month and still not see everything. Yet the tourists pay fabulous prices to go way out in the sticks when they could rent a car and wander that area for a week for the same price. Also note on there the winding '4 wheel drive only' in parts road that goes from Samoeng west north westish to Mae Hong Son. To my mind, The Great Nightmare. As the crow flies, about 100 kilometers. There are probably 300-500 villages in that area, and a conservative guess, 500 miles of a maze of roads. None are marked. Asking directions from the locals is hopeless as they, more often than not, have never travelled the length of the road, are more interested in only getting to some other neighboring village, have no sense of time, and often refer to going somewhere in their minds by having to walk, or go by motorcycle as a 4 wheel vehicle can't get through. Things they never take into account when giving directions. Add to that the more well used roads are usually not the through road but roads to various farms and fields. Worst case scenario of The Nightmare was some tourists who rented a jeep and ultimately, after being lost for about 5 days, abandoned the vehicle and walked out, coming out the south side near Doi Inthanon. There is almost no section of The Nightmare that can be travelled over 10 miles an hour. A full 3/4ths of the roads are impassible for 6 months during and after the rainy season, only repaired by the locals as they need to use them. About half the people out there don't speak Thai very well if at all but speak any of maybe 10 tribal languages or Burmese. The only way to do The Nightmare is with a huge tank of fuel (Baby's is 40 gallons) and simply have the general destination of the other end in mind but not concerned how many days it will take. My record is 2 days. One 12 hours of driving, one about 8. If the road is impassible and there is no detour, you have to hire the locals to fill in the ditches a bit. And occasionally, help roll Baby back on her 'feet' after an oops.